Fixed an occasional crash when editing some effects containing parent-fields. Fixed a rare crash when importing FBX without geometry, and only animation. Fixed a bug when importing into a new project packages that did not contain a PopcornProject.xml file. Sampler double-curve : fixed bug that caused tangents of the second curve to be reset when the effect was loaded. Flocking evolver : Fixed NaNs at first frame in demo flocking scene (FullIntegration) : bad first initialization of mean neighbor directions. Spawner evolver : Fixed CustomSpawnMetricScaleField bug : was not taken into account when loading the effect. HBO text reader: now recognizes optional UTF8 header and skips it. Some text editors will silently add this header if you open the .pkfx files in text mode. Editor now logs an error when failing to load corrupt effect files, and gives more details about what went wrong. Effect file wasn't seen as modified after renaming a layer. Script compiler : now correctly replaces integer mul/div/mod with powers of two by left-shift/right-shift/bitwise-and operations. Script compiler : now correctly replaces logical '!' on compare results by the inverse compare. Fixed 'Clone' command in content-browser: now removes the read-only flag in the newly cloned effect. Spawners/layers : fixed a crash and various other bugs when changing the type of a flux-driving attribute while bound to the flux factor expression of a layer. 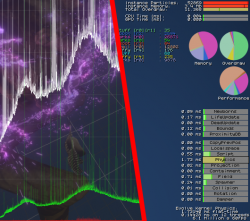 BREAK : Renderer Ribbon : billboarding now consistent across axis systems. LeftHanded projects had their ribbon's textures flipped upside-down. Shape samplers : Fixed occasional memory corruptions in distanceField() & project() functions. Projection evolver : Fixed occasional memory corruptions. Mesh renderer : right-click > explode submeshes to descriptors : fixed bug that did not copy the original descriptor's properties to each child descriptor. Mesh renderer : fixed a crash of the ATI/AMD graphics driver when using the unlit 'Solid' material. When viewport size is reduced, perf HUD now adapts to a more compact version. 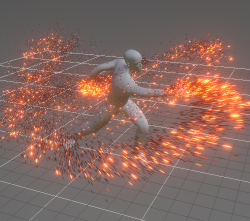 Particle renderers : Now displays 'Diffuse' / 'Normal' / 'Specular' texture node properties only when appropriate based on the selected material. Fixed : Analyzing resources in the details panel sometimes crashed if the asset list contained an effect with an audio renderer. Project selection : reworked online packages panel to display two explicit 'Create New' and 'Import' buttons, in replacement of the old obscure way of doing this. Project selection : Importing an online package into an existing package that has a different folder layout will now work properly. Spectrum sampler's Audio viewer did not display for attribute-samplers. Various bugfixes and improvements regarding the online packages. Improved project creation from packages. entering a value too large for a float in a numeric or vector property froze a part of the editor UI. Can now drag&drop a .pkkg in the project list to create a new project from it. Texture sampler : now safely renormalizes the RGBA weights used for density sampling. added a bunch of tooltips on the properties of samplers, evolvers, and renderers. Fixed broken textures hot-reload in some cases. Curve editor : Fixed broken curves Min/Max limits in linear mode. 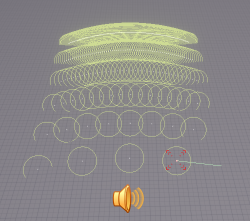 Curve editor : Changing Min/Max limits now correctly refreshes the curve-editor viewport. Fixed newborn particles update miss : fixes some localspace bugs with some Evolver spawner, and localspace bugs with FirstSpawnDelays. Fixed a bug in the script compiler that produced incorrect results when directly initializing a local variable with another local variable of the same type without changing it. Texture sampler : Fixed creeping random crash in density sampling mode. Happened whenever the density image had a first row of entirely black pixels. Texture sampler : Improved sRGB handling with older DXT-compressed images. Texture sampler : Load times slightly faster, does not allocate an additional pixel-buffer when converting sRGB <---> Linear anymore. Converts in-place. Disabled 'if' and loop constructs in scripts : They were not implemented, did not work anyway, and could cause crashes if still used. Will be restored when a stable implementation will be made. Scripts : fixed a bug when assigning a local variable into itself (ie: "float a = 1; a = a;" or "float a = 1; a = a + 0;" or "float a = 1; a = a * 1;"
Improved performance of all curve-sampling functions. Up to 12 times faster on PS4/XBOne, up to 3 times faster on all other platforms. Can now preview and sample animated meshes inside the effects editor. BREAK: for triggered Burst Layers, SpawnerScript "SpawnerLifeRatio" now has the expected value (it was the parent particle's LifeRatio). Use "parent.LifeRatio" to get back the old values. Evolver attractor : added an attraction mode where you can specify a max attraction distance and custom falloff. Texture sampler : sample density : can choose which channel to use, and if choosing average (was the default before), can now override the RGB averaging weights. All renderers : can now specify a custom 'Position' field. Billboard renderers : can now specify custom 'Rotation' field. Ribbon renderers : added ligthing and deformation materials. Shape sampler : Added a new 'sampleVelocity()' function, That allows sampling the surface velocity of skinned meshes. New sampler : CParticleSamplerText. 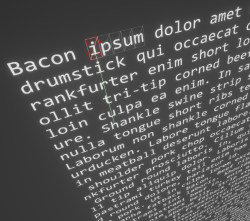 Use with a full or partial ASCII texture atlas to display particle-based text. Custom command-line to validate the effects (impacts on the 'status' column of the details view). Show Project Settings : You can view or modify properties associated with your project in he Properties window directly from the ContentBrowser. Changed bake dialog : CTRL+B now performs a silent bake without popping a dialog. To access the old bake dialog, use CTRL+SHIFT+B. Particle Attributes : Can now reorder attributes using right click > MoveUp/MoveDown. Resource Selector : Node properties now display the full resource path in the tooltip. Resource Selector : Added a 'Open file location' menu item when right-clicking on a resource path in the node properties panel. "Save As" now prevents access to file path : We've decided to entirely remove that window in 1.7 and replace it by an explorer dialog. Editor now auto-detects if a curve should be in loop mode. Improved debug editor HUD : added performance indicators to help optimize your effects, in addition to existing memory and overdraw stats. This page was last modified on 13 July 2017, at 18:31.